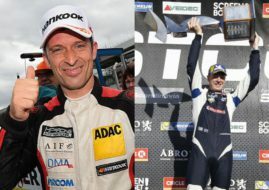 Thed Björk and Fredrik Ekblom claimed one victory each at Gelleråsen Circuit in Karlskoga to secure the 2015 Scandinavian Touring Car Championship teams’ title for Volvo Polestar Racing. Championship leader Björk started the weekend in the best way possible with pole position, a new lap record and a superior victory in the first race with team mate Ekblom in second place. Behind two drivers with Volvo S60, Mattias Andersson (Dacia Dealer Team) finished on third place. In the second race with reversed grid, Björk started tenth and Ekblom ninth. Ekblom was able to avoid the first lap chaos and charged his way up into the lead to take the victory. Behind Ekblom, Mattias Andersson was second and third was Richard Göransson (Team Tidö) in a Saab 9-3. Björk got caught in an incident in the second corner of the first lap and spun off track. The three-time champion was able to rejoin the track and climbed seven positions to charge back up to fourth position. This double victory means that Volvo Polestar Racing has secured the 2015 STCC teams’ title for the third year in a row. The fight for the drivers’ championship meanwhile is wide open with Björk increasing his lead by just one point to 10 points over Ekblom ahead of the penultimate race at Solvalla in four weeks.